DRW’s story began on August 1, 1977, when the Wisconsin Coalition for Advocacy (WCA) was born. The WCA (now called Disability Rights Wisconsin or DRW), was created on the executive order of Governor Martin Schreiber, to meet a federal requirement for states to have a Protection and Advocacy agency (P&A) for people with developmental disabilities. The idea to create a P&A agency for people with disabilities had been discussed by the disability community for some time before 1977. The citizens in the disability community and allies already had many shared values. Because the planning and creation of the WCA was a citizen-led process, many of these values were adopted as WCA/DRW’s core values. These values are: Liberation, Inclusion, Independence, Dignity, Diversity, Accessibility, and Human Rights. DRW is unique for a P&A agency in that we are founded on these strong, defined values. Because of these values, DRW has made great strides in advocacy over the years. We have grown, implemented groundbreaking policies, and tackled cases that other state P&A programs haven’t been able to. To learn more on how the Protection and Advocacy system came to be watch this video produced by Rooted in Rights. Living in nursing homes or institutions can be socially isolating and harmful to a person’s opportunities and happiness. Furthermore, living in a facility is often not a person’s choice. Because of this, one of our top priorities and values has been liberation of people with disabilities from care facilities. We believe that all people with disabilities should be able to live in their home communities, in integrated and non-restrictive settings. In 1981, four years after our agency’s creation, we published a report titled “Life in Limbo: A Report on People with DD in Nursing Homes”. This report documented the inhumane conditions faced by people residing in many nursing homes in Wisconsin. Life In Limbo revealed harm being done at nursing homes, and showed the public that life in nursing homes and large residential facilities could be very distressing. Lynn Breedlove, former executive director of DRW, says that many of the residents of the nursing homes felt like they were “incarcerated.” They were treated badly and were sometimes kept at nursing homes against their will. Even though, Lynn says, “for less public money, [people with disabilities] could live in [their] own homes”, many counties preferred to house people with disabilities in nursing homes, as the counties did not want the extra work of supporting less restrictive housing for people with disabilities.. Nevertheless, Life in Limbo opened peoples’ eyes to the need for liberation, and along with the report, we campaigned against counties with inhumane nursing homes, and campaigned for more humane practices in nursing homes. We also helped to lower the need for privately funded nursing homes by aiding in creating the Community Options Program, which funds alternatives to nursing home care for people with disabilities and elderly people, enabling them to stay in their own homes and communities. These efforts have turned out to be a success, and over the years more and more people with disabilities have been liberated from nursing homes. In 1985, we helped liberate Joseph Seiler from the Central Center for the Developmentally Disabled in Madison. The Central Center (Also known as the Central Wisconsin Center) was formerly a residential and treatment facility for individuals living with intellectual disabilities. Joe had been a resident there since 1982, when he was placed there by Brown County, but Joe and his family wanted Joe to return to his home community in Brown County. Life at the nursing home was hurting Joe and his education. However, the government of Brown County refused to support Joe’s move to a community residential setting in his home county. Instead, Brown County chose to keep Joe in the Central Center, away from his home and family, and against his wishes. This decision was not because the Brown County government lacked funding. In fact, they had the funding, the county government simply chose not to use the funding available to them under the Community Integration Program to help Joe. This money could have allowed them to return Joe to his home community. When DRW intervened, we helped Joe win his case against Brown County, and protected his right to return to his community. Joe went home, and was able to pursue greater independence, skill-building, and education in his home community. We believe that people with disabilities have the right to live, work, and attend school in the most integrated settings possible. Integration is necessary for many reasons, including ending social isolation, access to better education and care, and the feeling of belonging that comes with being a part of a community or society. But also important is that as more people with disabilities are seen and heard in the community, acceptance of disability rights will become more widespread. 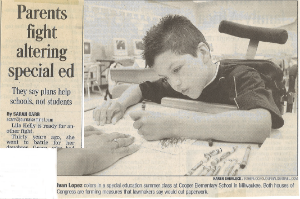 In 1983, when we began our work protecting the rights of children with disabilities, one of our most pressing concerns was to make sure children with disabilities were included in schools, classrooms, and educational services. Only a year later in 1984, we had the chance to make a statement when we won Williams v. Overturf, a landmark lawsuit for special education and the rights of all children with disabilities in Wisconsin. Rachel Williams, who had a developmental disability, had not been learning at school, so her family had taken her to be evaluated at a disability rehabilitation program. Rachel’s doctor at the program determined that, given the right educational environment, Rachel had “excellent potential” to make many educational gains. The doctor and the parents realized Rachel was never given this environment at school, so Rachel’s doctor recommended the school provide certain programs and services for Rachel to help her learn. Rachel’s parents agreed, but the school district refused to give Rachel the proper special educational services, again and again. It was time to act. Rachel and her parents sued the school district for not providing Rachel with services the school was obligated to give, and we provided legal representation and advocacy for Rachel and her parents. Eventually Rachel won the educational services she needed to thrive at school. Through this landmark case, WCA affirmed the rights of children with disabilities to be included in public education programs that are free and appropriate to their needs. Red Cedar Hall was a segregated school for children with disabilities, set up in the Rice Lake School District in Northwestern Wisconsin. 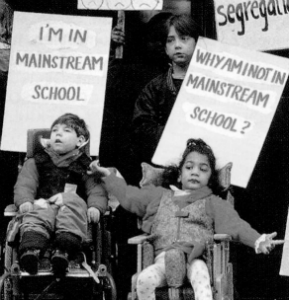 Disability Rights Wisconsin has always supported integration of children with disabilities into their home school districts, so it was a victory for DRW when Red Cedar Hall closed in 2005. The victory signaled the power of our unwavering effort to bring children home to their school districts. Pat Kelly says that DRW helped “lay the groundwork for closing Red Cedar Hall over several years.” Having the Northwest office in Rice Lake from 2003 helped, but the real turning point of the decision was a forum on special education that we helped organize in Barron County in September of 2003. There were a diverse set of speakers at this forum, including school staff, parents of children with disabilities, and DRW’s Mark Sweet. Most of the people at the event talked about what was best for their kids, and many people came out to listen to each other and consider what the change meant. After the forum, DRW began working closely with school districts and directors of special education committed to inclusion. In time, parents began to question the validity of having a segregated school, and Red Cedar Hall, slowly but surely, began to close its doors. Although the change was difficult for some families and school staff, it was a change for the better, and it was a major step towards integration and inclusion of children with disabilities in Wisconsin schools. We believe that people from all backgrounds, from all across Wisconsin, deserve advocacy, and we work tirelessly to make sure that we are reaching those who need help. Whether they are in urban neighborhoods or rural areas, in cultural or religious minorities, we try to reach everybody we can. Milwaukee has always been underserved by disability services, and the people of Milwaukee never felt like the Milwaukee Metropolitan Area could be adequately served by the Madison office. That’s why, in 1992, DRW opened its second office in Milwaukee, to better serve the disability community in Southeast Wisconsin. But this still wasn’t enough to properly serve all people with disabilities in the Milwaukee area. Low-income and especially low-income minority youth with disabilities were still much more likely to be left out of getting key benefits and services due to financial and social barriers. Many families from poor and minority communities, especially African-American communities in Milwaukee, received few or no services related to their disability. This was a well-documented problem, and in 2016, DRW got its chance to help when we received funding from the Greater Milwaukee Foundation for a project in Wisconsin’s largest city. 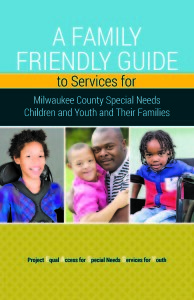 This project allowed us to embark on an outreach and advocacy initiative to help African-American families and their children with disabilities in Milwaukee County. Our initiative aims to increase participation of African-American children with disabilities, as well as their families, in home and community-based services. We do this through engaging with and informing Community Connectors and partner agencies, creating materials to help partners in connecting families/children with services and with DRW, and through outreach out to families. As a result of our outreach in Milwaukee, we have been able to serve many more people with disabilities. Back in 2005, we provided one-on-one advocacy to 2408 people across the state of Wisconsin. Today, that number has increased to 3862, with the most growth occurring in Milwaukee and surrounding counties. In 2003, Disability Rights Wisconsin opened its third office in Rice Lake, to serve the Northwest areas of Wisconsin. Historically, these areas have had little to no access to disability services. Many people in the Northwest have no access to internet or transportation, either, which meant that access to transportation was one of the key initiatives for DRW’s new office. However, 2009 saw a massive shift in how the Rice Lake office performed: It was this year that DRW established a real presence and long-term commitment to the area. Working on the full range of DRW priorities, the Rice Lake office showed a massive jump in 2006 to 222 people asking for help from the Northwest of the state, double that of the previous year. We believe in the right of every person to have autonomy and to make their own personal life decisions, and to have these decisions respected. DRW’s Monica Murphy won the landmark ADA case nationally known as the Chuck E. Cheese’s case in 1999. The case was to contest job discrimination against Donald Perkl, a man with an intellectual disability who was fired from his custodial job at Chuck E. Cheese’s without cause. Donald Perkl had been perfectly able to do his job at Chuck E. Cheese’s and had been incredibly excited about getting and maintaining his job. He was only fired after the restaurant’s manager had said he did not want “those people” working at his restaurant. This was a classic case of discrimination based on disability, and the jury found that Chuck E. Cheese’s was guilty of violating the ADA. The court required Chuck E. Cheese’s to provide damages for the maximum amount allowed under the ADA. 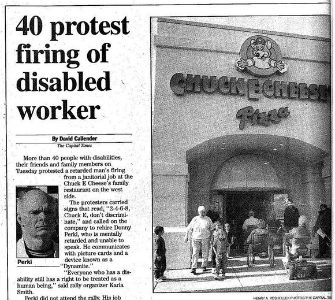 Donald was rehired, and Chuck E. Cheese’s was required to provide training in the ADA. This case won a national award, and was a major victory against discrimination in the workplace. In 2005, DRW oversaw efforts to downsize intermediate care facilities around the state and move residents with developmental disabilities to the “most integrated” setting possible in their home communities. Disability Rights Wisconsin had previously strongly advocated for policy change on Intermediate Care Facilities (ICF), and finally got that change in 2004 when the State of Wisconsin committed to moving people out of multi-bed institutions, into what was meant to be individualized, community-based care. Five out of six ICF-MRs—intermediate care facilities for people with developmental disabilities—closed or met their downsizing goals in 2005 and early 2006. We oversaw this process, helping to relocate, monitor, and provide advocacy to individuals. DRW did meet with resistance, however, when the state and some of the care facilities preferred to save money and not do the right thing. Some facilities tried to re-open under new names, and other times former patients were not given individualized, community-based care because it would cost too much. Still, DRW fought and continues to fight on for the independence of people with disabilities, and hundreds of people who had spent decades in institutions moved to community settings as a result of this program. 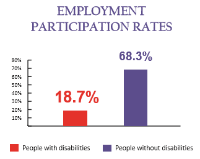 LOW EMPLOYMENT RATES: Despite the fact that 80% of people with disabilities say they want to work, only 18.7% actually have jobs, compared to 68.3% of people without disabilities. Source: Bureau of Labor Statistics, December 2013. Want to understand more about barriers in employment and sub-minimum wage? Watch this excellent documentary called Bottom Dollars from Rooted in Rights. We believe everybody deserves the right to be treated with respect and dignity, and to have the basic benefits and services that keep them healthy and alive. 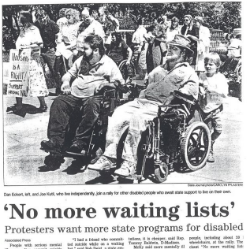 In the 1990s, there were massive worries among the disability community about the poor state of the Milwaukee paratransit system. The system used unsafe vans, often missed and cancelled rides, and sometimes even denied service to the people with disabilities who used their services. In 2000 the start of the FCIA (Family Care Independent Advocacy) program, which after three years failed but was eventually brought back as the FCIOP (Family Care & IRIS Ombudsman Program), which has been incredibly successful. The Family Care and IRIS (Include, Respect, I Self-Direct) programs mainly make sure elderly people and people with disabilities have access and the opportunity to live independently under self-directed care programs, instead of living in an institution or a nursing home. Our staff in the Family Care & IRIS Ombudsman program help to provide legal aid to people experiencing difficulties with applying, gaining access to, or receiving benefits from these successful and helpful programs. 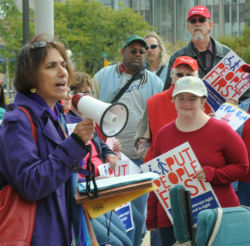 In May of 2009 Disability Rights Wisconsin sued UW Hospital to change hospital practices. Attorney Mitch Hagopian said he worried some UW Hospital doctors may be too quick to suggest withdrawing treatment from a developmentally disabled person they perceive to have a low quality of life. State law prevents parents and guardians from withholding treatment from patients who can’t make that decision for themselves unless they are in a “persistent vegetative state,” however some UW hospital doctors did not think that it applied to their developmentally disabled patients. “It’s a great medical institution. They provide great care to their patients,” Hagopian said. 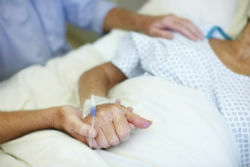 “All we want is for them to provide that same great care to developmentally disabled people who are not dying.” DRW successfully negotiated a settlement in which UW Hospital changed their end of life policies by removing all references to “quality of life” as a consideration in determining whether life-sustaining medical care should be withheld or withdrawn. We believe in making Wisconsin accessible to people with disabilities, as all people should be able to live in a society without barriers. On September 13, 2001, seven students with disabilities, assisted by their parents, filed a class-action lawsuit against Milwaukee Public Schools (MPS) and the Wisconsin Department of Public Instruction (DPI), claiming that MPS was not following the IDEA (Individuals with Disabilities Education Act). The students claimed that Milwaukee Public Schools had violated the students’ rights by not giving them full access to free, appropriate education, including Individualized Education Plans (IEP) and special education services. WCA attorney Monica Murphy represented them in-trial. The court eventually found both the Milwaukee Public Schools and Department of Public Instruction responsible for violating the IDEA in 2007. The court reached a settlement, and demanded a serious improvement in how the school district responds to children with disabilities. This case affirmed the right of every child, with or without a disability, to a free public education and services necessary to make that education possible. DRW aided in the creation of the Milwaukee Mental Health Task Force, a joint force that aims to raise awareness of issues that all people affected by mental illness face. The task force also advocates for improvements in services facing people with mental illness, and help overcome barriers and stigma attached to mental illness and mental illness services. DRW administers the task force budget and coordinates its day-to-day operations. Today, the task force consists of more than 45 member organizations that represent many groups: consumers, advocates, provider groups and health care systems, legal aid, law enforcement, social service agencies and other groups. This task force has helped to lead in the implementation of several successful initiatives, including Crisis Intervention Training (CIT) for hundreds of city and county law enforcement personnel, and a Crisis Intervention Partners network that extends CIT to emergency medical personnel, health care professionals and correctional officers. We also assisted with the creation and implementation of a Crisis Resource Center which helps people with mental illnesses stay out of the criminal justice system.The Task Force and DRW also helped to design the adult mental health system in Milwaukee county. Everybody has the right to be free from abuse and neglect . Unfortunately, people with disabilities are targets of abuse and neglect at higher rates in institutions and their communities than the general population, which makes human rights are one of our top concerns. 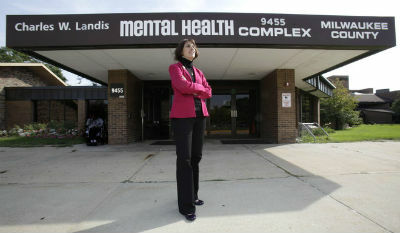 In 2011, DRW investigated the Milwaukee County Mental Health Complex (MCMHC) after reports of assaults proved that the system was badly failing the patients. This investigation revealed that the County Mental Health Complex had failed to provide patients with positive, individualized treatment, had given them a lack of community supports, and had left patients alone for extended periods of time with no protection or supervision. These practices had led to patient-on-patient assaults, which the center had no protections in place to stop. The investigation also found that administrators and staff at the MCMHC often ignored patient claims, and did not adequately train staff to deal with potential patient situations. Given all this, DRW filed an Update to the Community with its first findings, to seek improvements to the mental health complex. 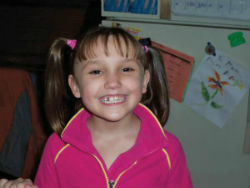 The 2006 case of Angelika Arndt was a wake-up call to the public and to DRW about the use of unlawful seclusion and restraint in schools and mental health programs for children. Angie, seven years old, who had emotional and cognitive disabilities brought on by early neglect and abuse, was progressing well, but needed extra interventions to help prepare her for first grade. 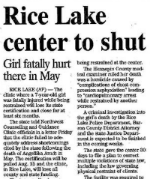 Angie’s parents put her into a day treatment program in Rice Lake, where she was to spend two weeks of summer therapy. But because she blew bubbles and swung her legs, in a blatant disregard for Angie’s human rights, staff members secluded Angie in an isolation room and pinned her to the ground. They sat on her until she stopped breathing and died. Nobody was ever charged with a crime for Angie’s death, and Angie’s parents could not do anything except contact DRW. In Spring 2009, DRW and allied agencies issued a report chronicling children who had been put at risk or harmed through seclusion and restraint. DRW helped draft legislation and championed the passage of 2011 Wisconsin Act 124 in 2012, which established a framework meant to protect children against abusive, unlawful, or unnecessary seclusion or restraint. DRW continued to watch data on how and when seclusion and restraint practices were used in schools, and we continue to fight to make sure that the human rights of children with disabilities are protected. Liberation for those in abusive, neglectful, or unwanted situations, or in institutions and other segregated settings. Inclusion of all people with disabilities in schools, communities, employment, and social programs. Independence and freedom to live as one chooses, without being confined to nursing homes or institutions. Dignity, to have one’s needs, choices, and preferences respected, and to have access to basic benefits and services. Diversity, supporting all kinds of people, from all backgrounds, in every part of Wisconsin. Human Rights that all people are entitled to. 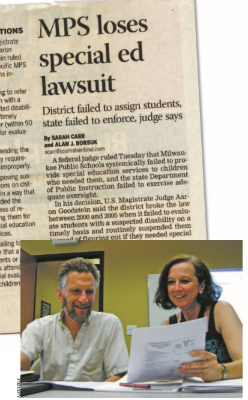 Thank you for reading, and for your support of Disability Rights Wisconsin! Helped Pass “Becky Young Act”: Supports Transition of People With Mental Illness from Prisons to Community. Sued UW Hospital and Clinics to Stop Witholding Treatment From Patients With IDD Who Are Acutely Ill.
“The Key to Your Future” Connects Consumers and Families to services that help youth with disabilities succeed in school and work.